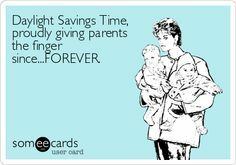 Dear Daylight Savings time.... REALLY?? But here are a few negative effects it has on adults not to mention kids... um try putting the kids to bed when its still a bit light out! Not fun. And have fun that week or 2 of you and the little bunnies missing that hour and trying to adjust. If nothing works (like it didn't for us) then grab an extra tea or coffee in the am and a beautiful bath, chamomile, wine or Zzzzquil at night...and know that we are feeling your pain. And there is actually 1 great thing we LOVE about DLST...an extra hour to play outside with the kids!